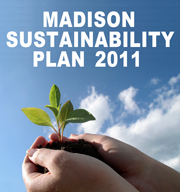 Join the City of Madison in an important effort in developing the City's Sustainability Plan. 'Sustainability' is the ability to meet our needs without compromising the needs of future generations. That's why we need to hear and learn from you. Also learn about today's Madison's Green Capital City projects. For more information, please contact Jeanne Hoffman, Facilities and Sustainability Manager at jhoffman@cityofmadison.com.